Tradition in the American south has wide influences. 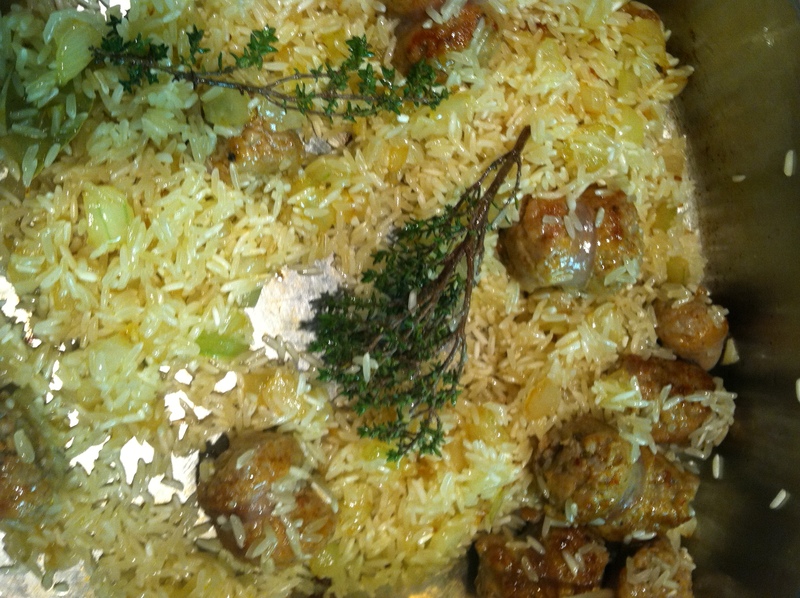 In this traditional New Years dish, you can see cultural influences from Europe and Africa. 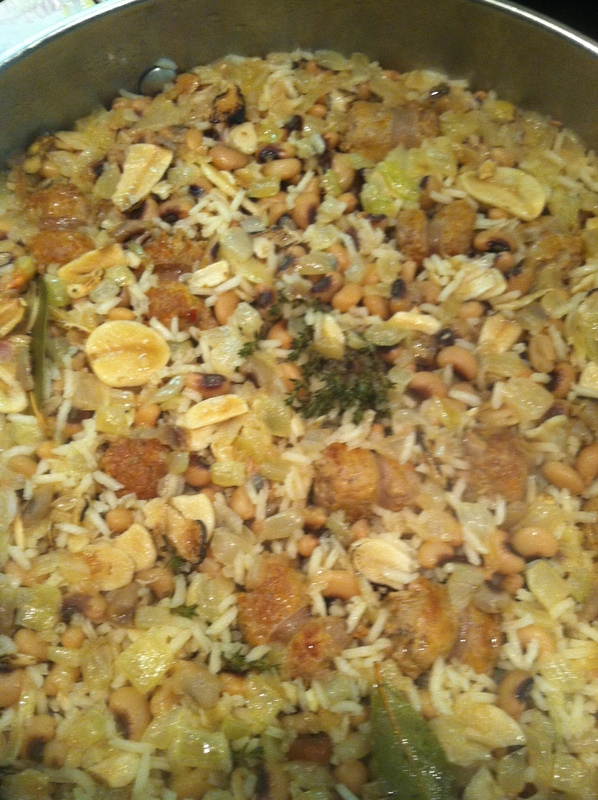 Hoppin’ John is a dish that combines rice and black-eyed peas. Typically it is flavored with a ham hock or bacon. But if you don’t eat pork, you can make a vegetarian version that is just as flavorful. 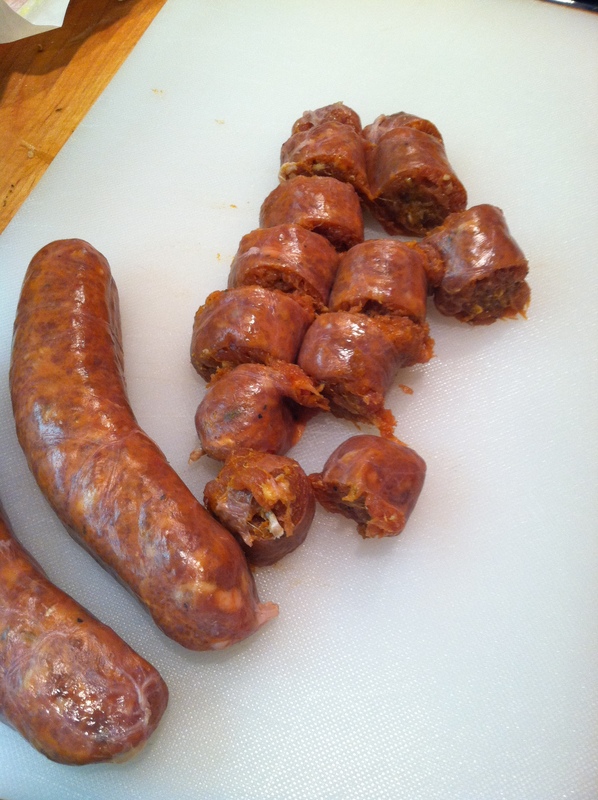 This year we used spicy turkey sausage and it was great! Stories go according to how many black-eyed peas you get on your fork, is how much luck you will have in the new year.Three peas should be left on your plate to represent health, wealth, and love or faith, hope, and charity or even luck, romance and money. The meal is accompanied with food items that represent wealth: greens like collards, turnip greens, swiss chard, cabbage or kale represent “folding money” so be sure to serve plenty of greens on new years. Carrots are cut into rounds to represent gold coins, corn bread is often served because it is the color of gold as well. Tradition states to eat like a pauper on New Years day and eat like a king the rest of the year. In some parts of the south, left-over “Hoppin’ John” is called “Skippin’ Jenny” after New Years day. After that, we just call it beans and rice, served up with a “mess of collards” and cornbread. Don’t forget the pot liquor. Slice the sausage into 1″ slices. Saute in olive oil for 3 minutes. Add onion. Sweat the onions (cook without browning) until they become translucent. 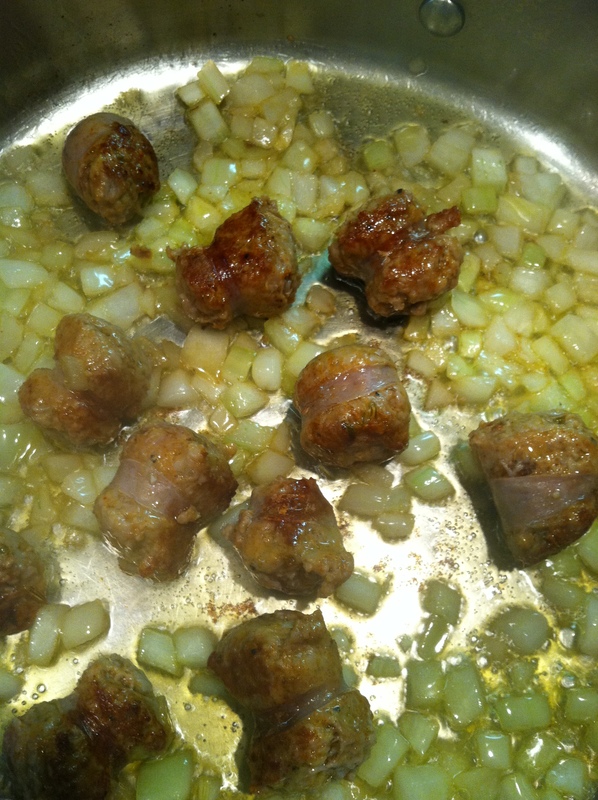 Add the garlic, rice and thyme. Stir to coat the rice. 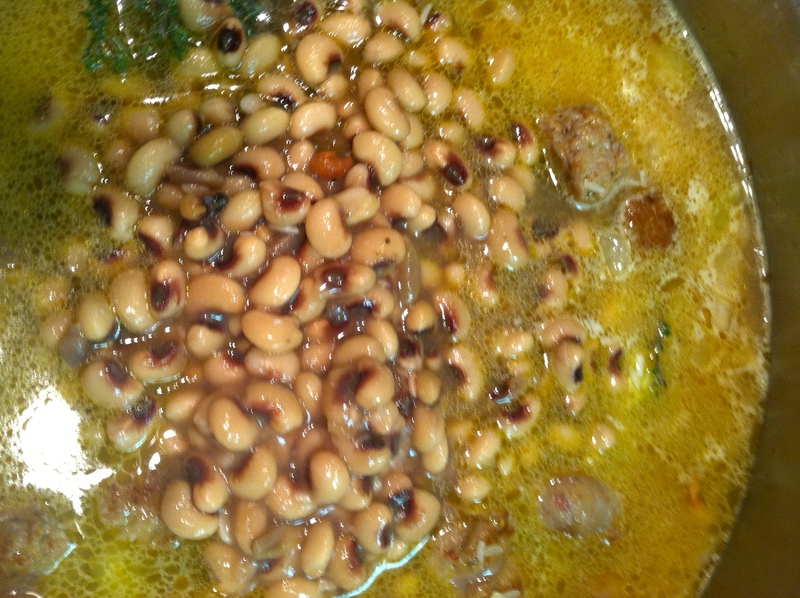 Add the chicken stock, black-eyed peas, oregano, salt, and pepper. 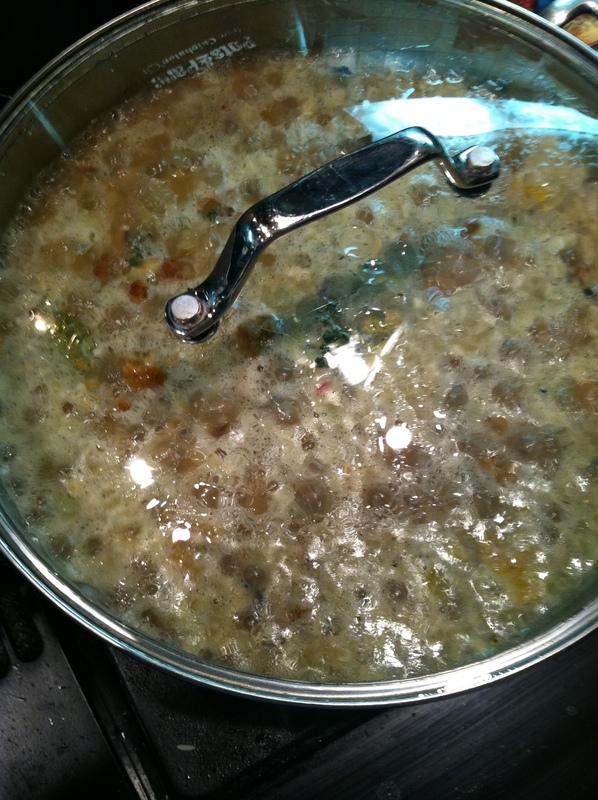 Bring to a boil, cover, lower heat and simmer 20 minutes or until the liquid has been absorbed and the rice is tender. 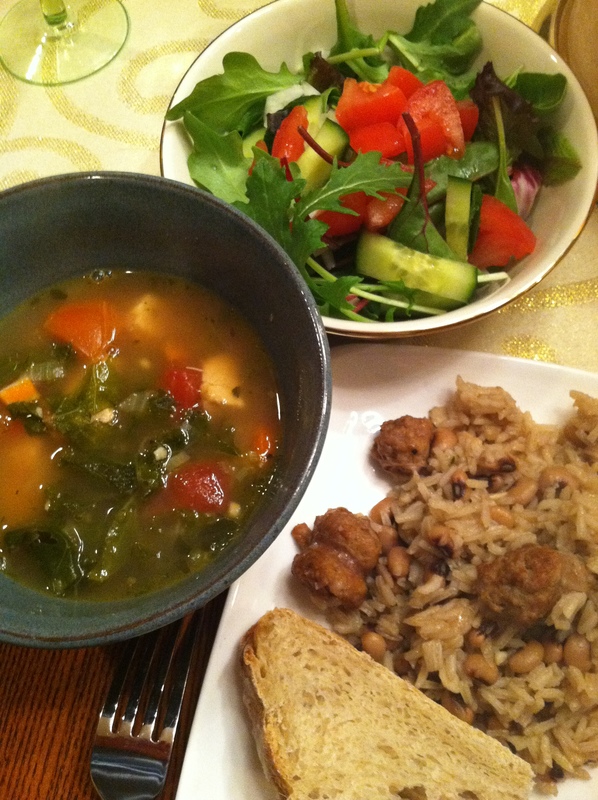 This entry was posted in Recipes, Southern Cooking and tagged beans and rice, Black-eyed pea, Hoppin' John, southern cooking, southern food, Southern United States. Bookmark the permalink. So, is that how many peas you get on your “first” forkful, or your last to count for luck? I wonder why in the world it’s called skippin’ Jenny. Makes me think whoever made it up was named John and Jenny was his daughter…..? That would be fun to find out! Hi Jennifer, thanks for stopping by! I have no idea how Hoppin’ John or Skippin’ Jenny got their names. However, like most things in the south, I am sure it has quite a story. A story I’m certain that is told while shelling peas in a rocking chair on the porch while sipping sweet tea. Oh, that just sounds lovely! Yum! I enjoyed your “Cook me a story” blog! You did? Oh, how sweet. Michelle and I had such a good time with that blog. She’s the one who introduced me to the blogging world. I learned so much from her. But then I moved away and she got a job as an editor. Though I still talk to her via Skype almost once a week, the blog came to a skidding halt, but neither of us had the heart to shut it down. We had so much fun doing it. It gives me great joy that you enjoyed our crazy pictures! 😛 Thanks!! Hi Pamela, I love food traditions. I must admit I had never heard of Hoppin’ John or Skippin Jenny. The things you learn in Blog land. Isn’t it fun! I learn a lot from you guys too.